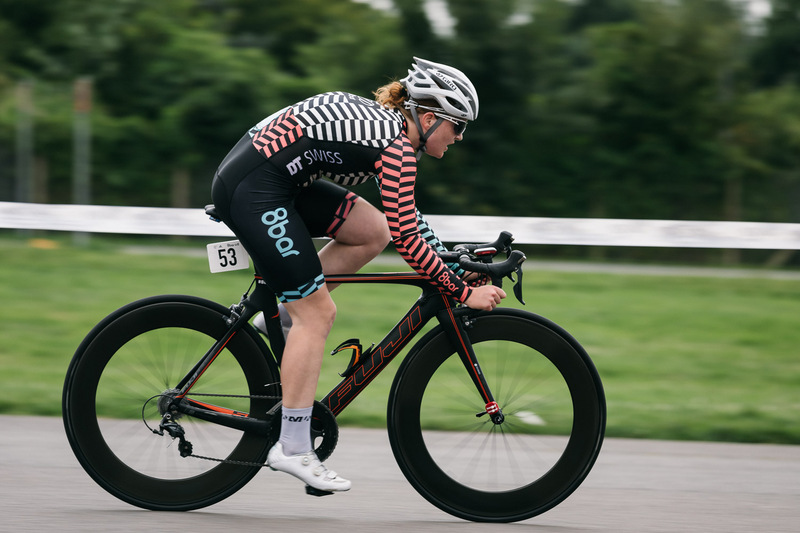 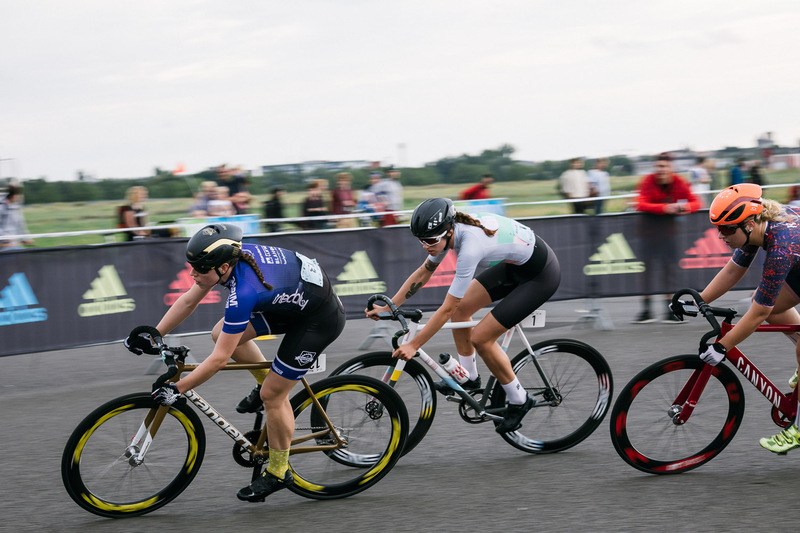 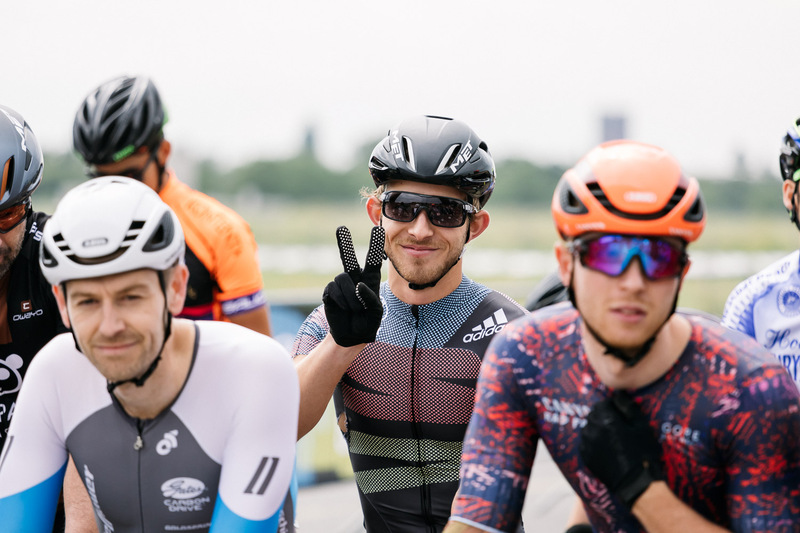 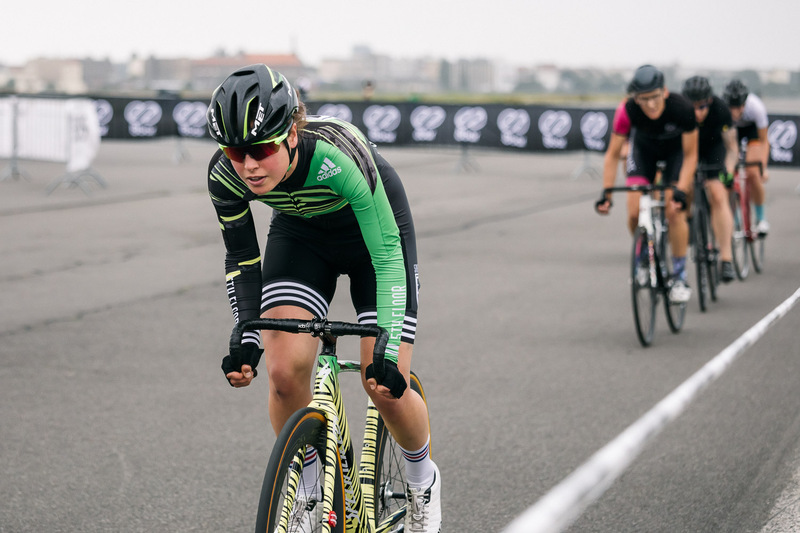 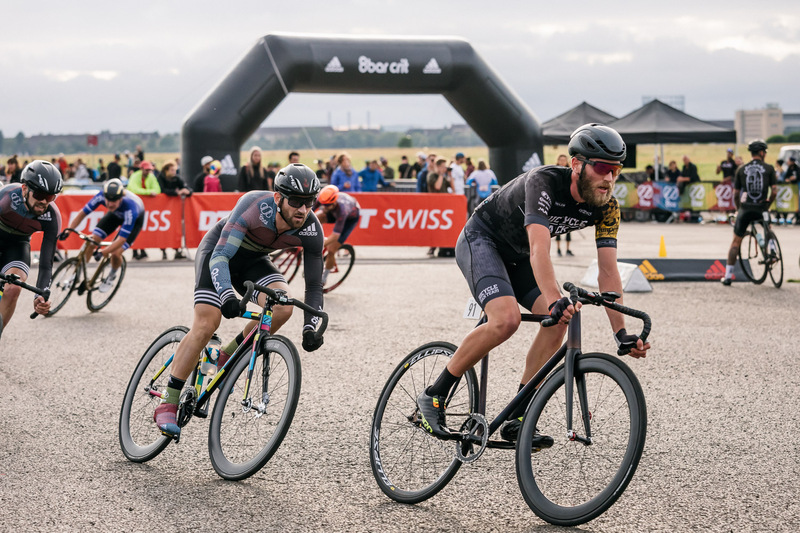 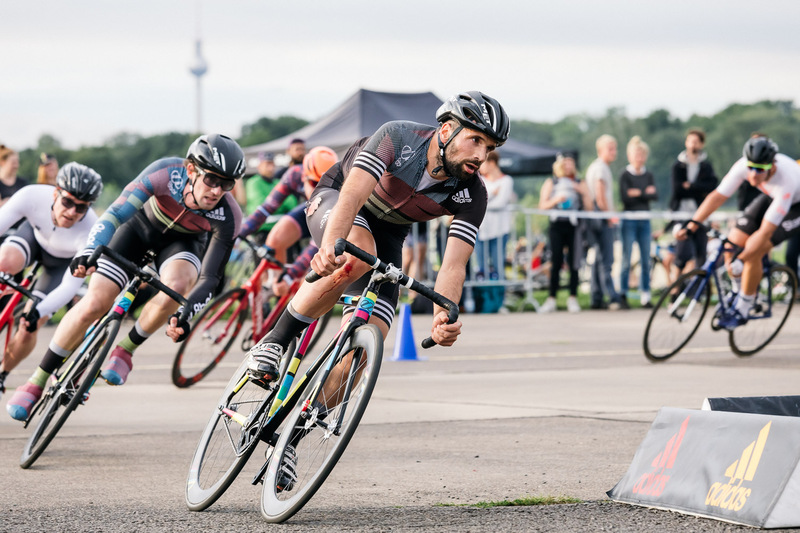 For the third time the 8bar crit took place on Berlin’s Tempelhofer Feld. 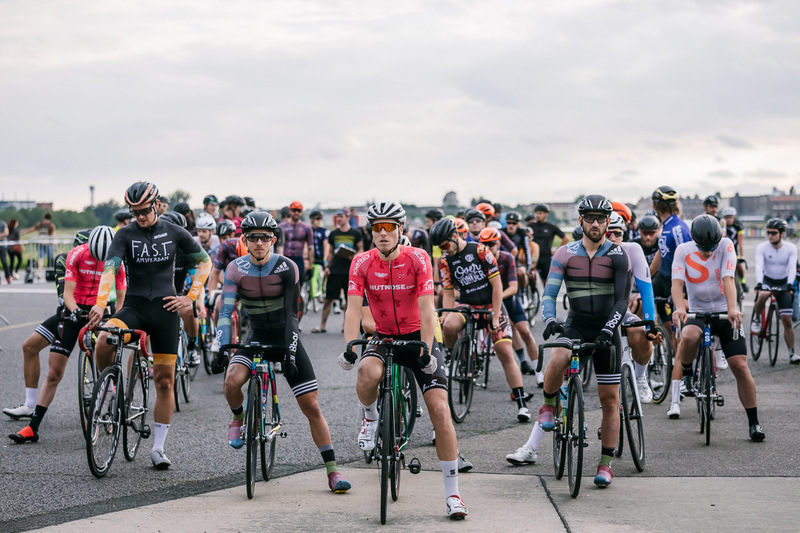 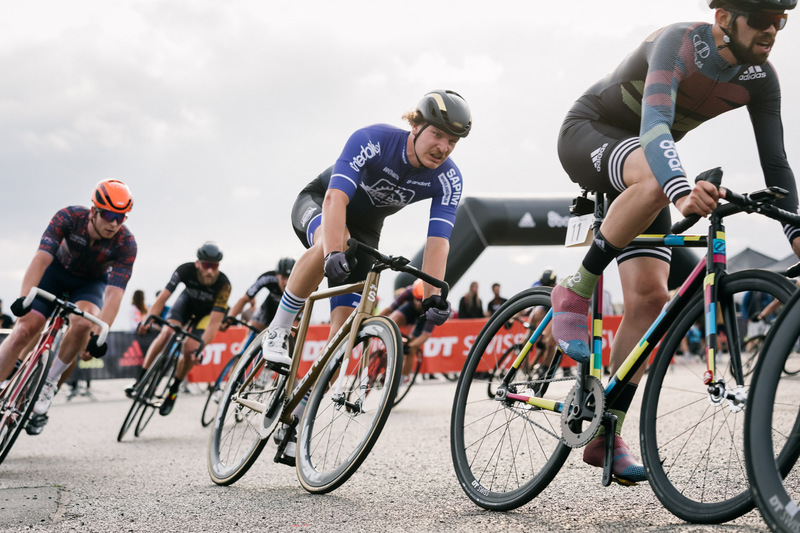 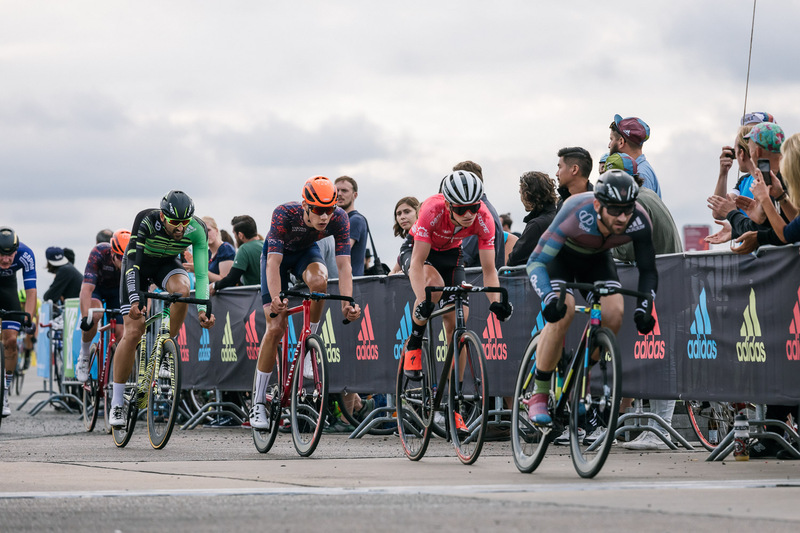 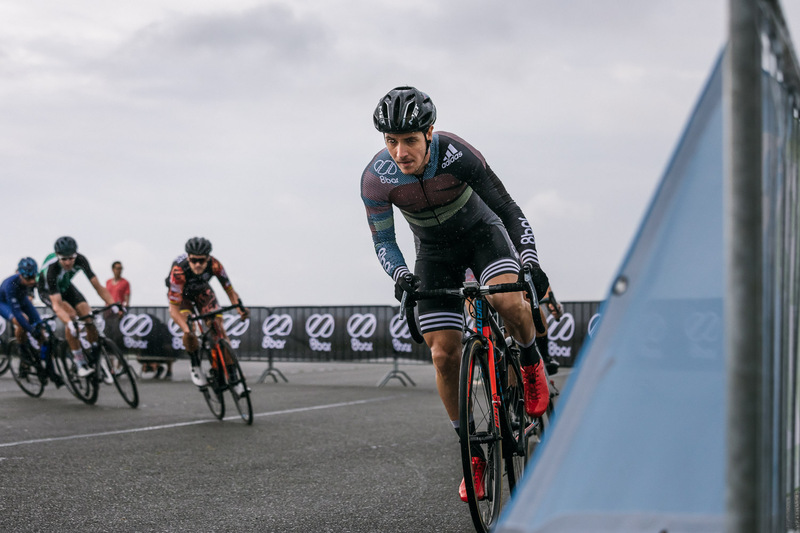 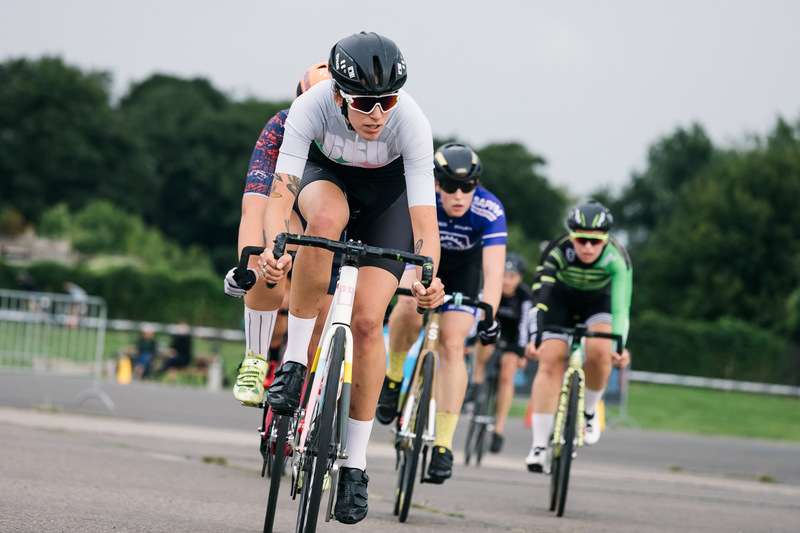 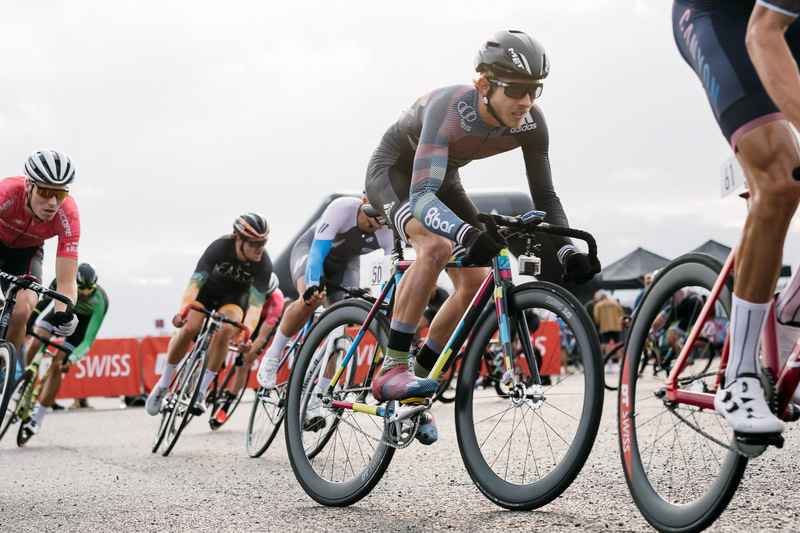 More than 150 cyclists competed in a fixed gear crit and in the new road crit on the 1,000-meter-long and technically demanding circuit. 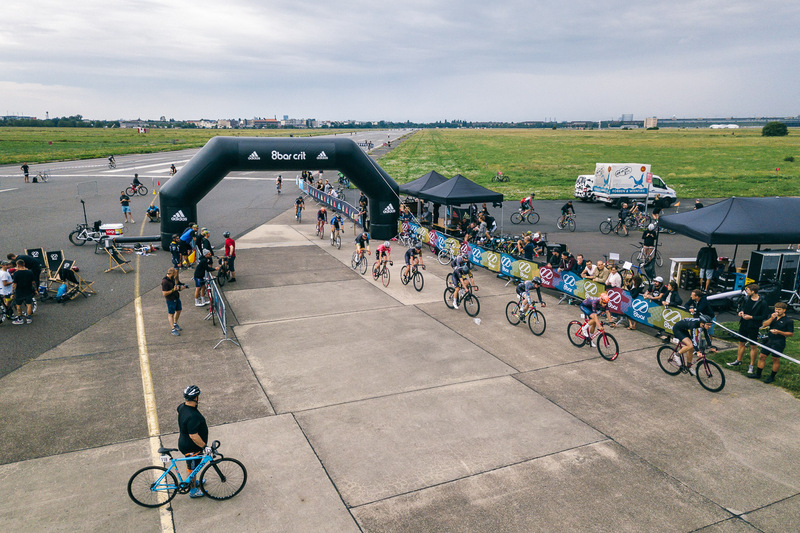 Tempelhofer Feld is the airfield of the former Tempelhof airport. 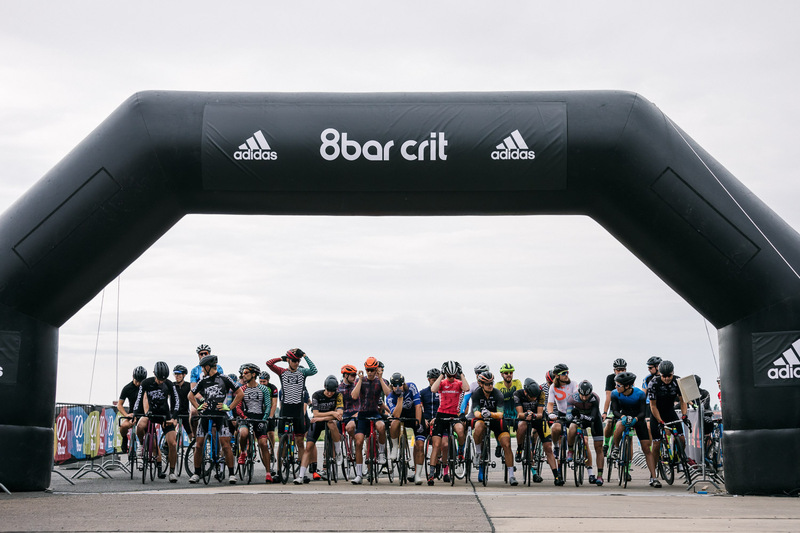 It is a large open-air area with constantly heavy wind conditions of which the many kite pilots are happy about but which was a challenge for the participants of the 8bar crit in combination with the alternating weather. 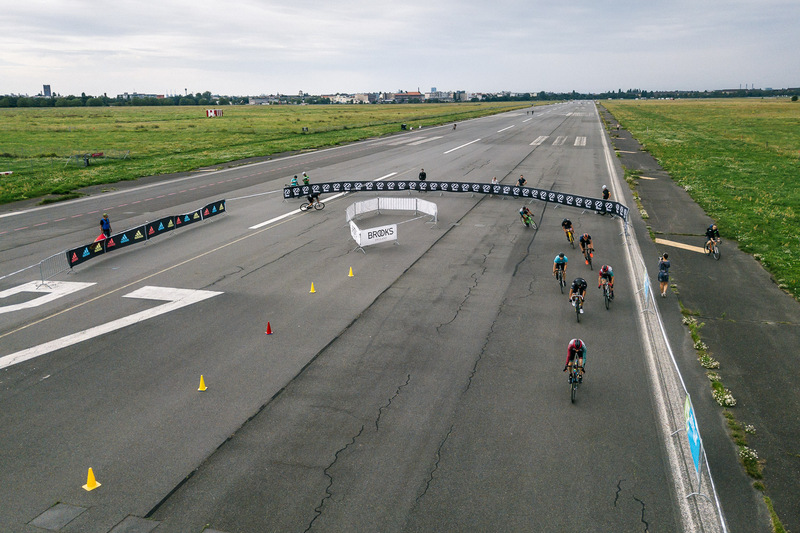 Thus, besides the tight corners, a long straight with a strong headwind needed to be handled by the riders. 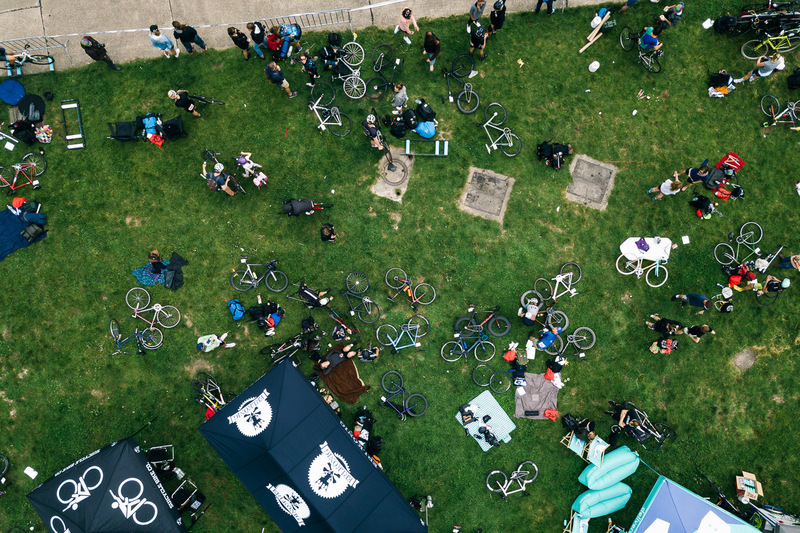 That was exhausting for all of them. 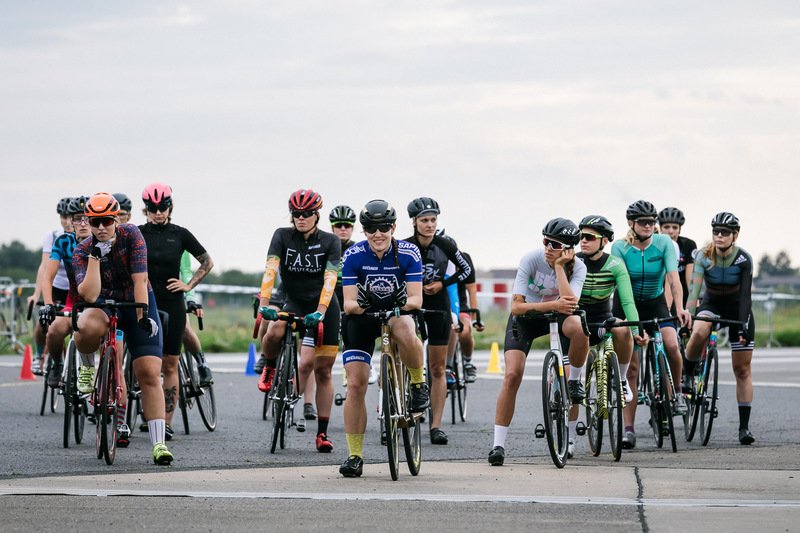 For training deficits there was no pardon on this circuit. 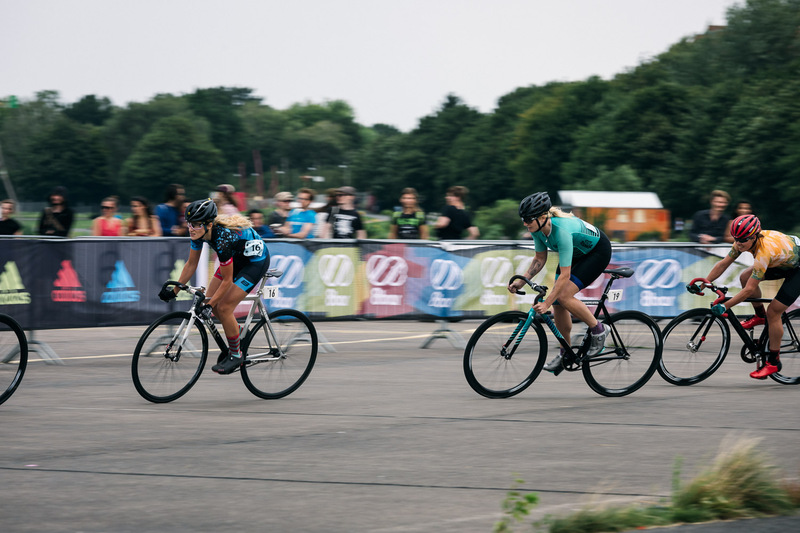 The women’s fixed gear qualification with 27 participants was important for the positioning in the final. 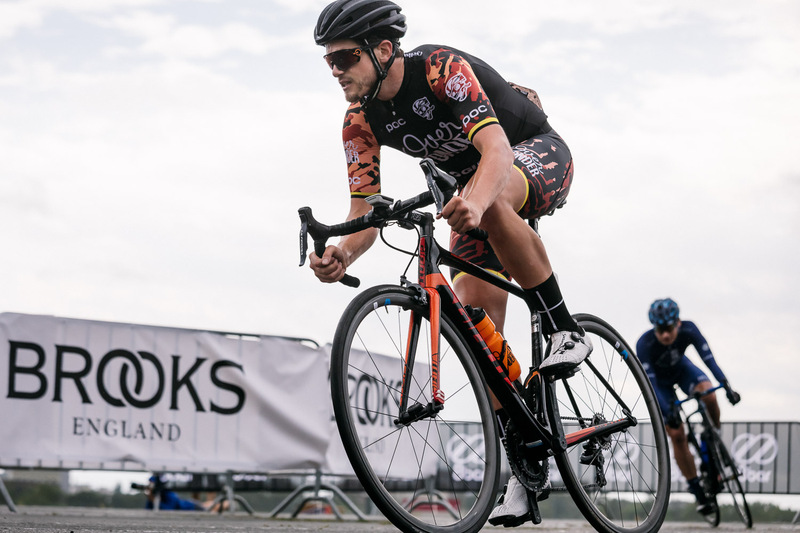 The fastest rider in the qualification was allowed to start from the front in the final. 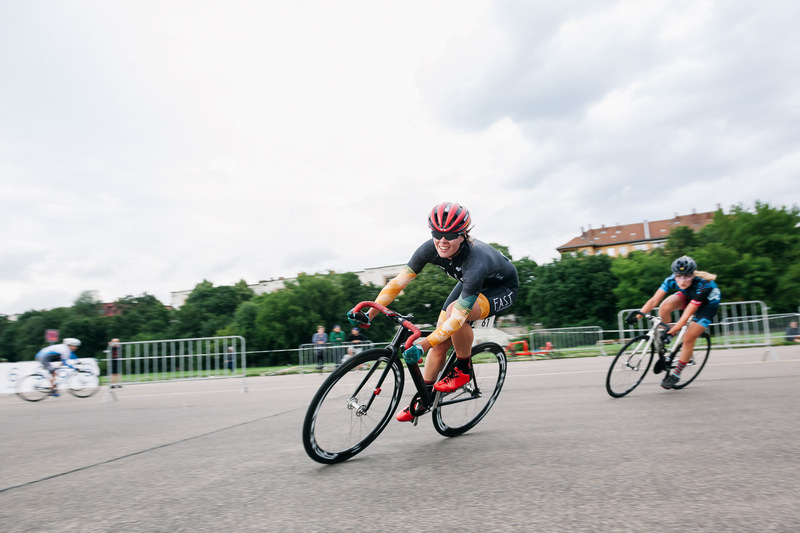 That is why the qualification was exciting as well. 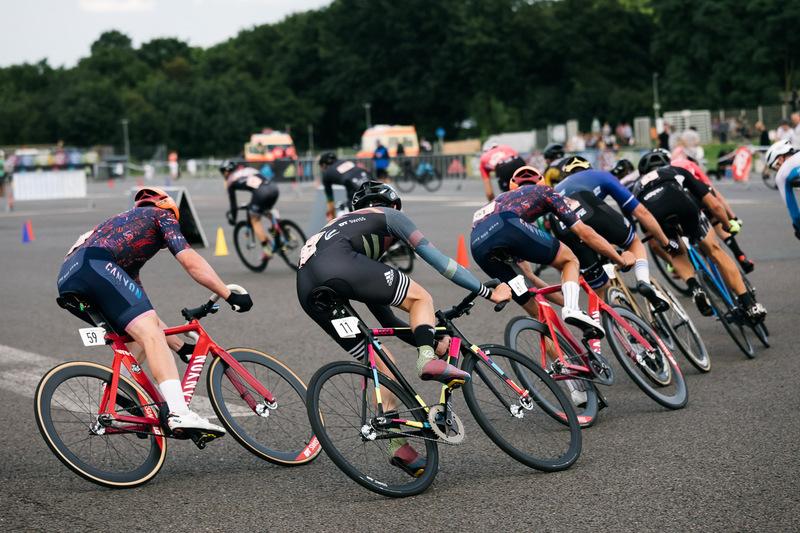 The riders really had to fight hard for their position in the final race. 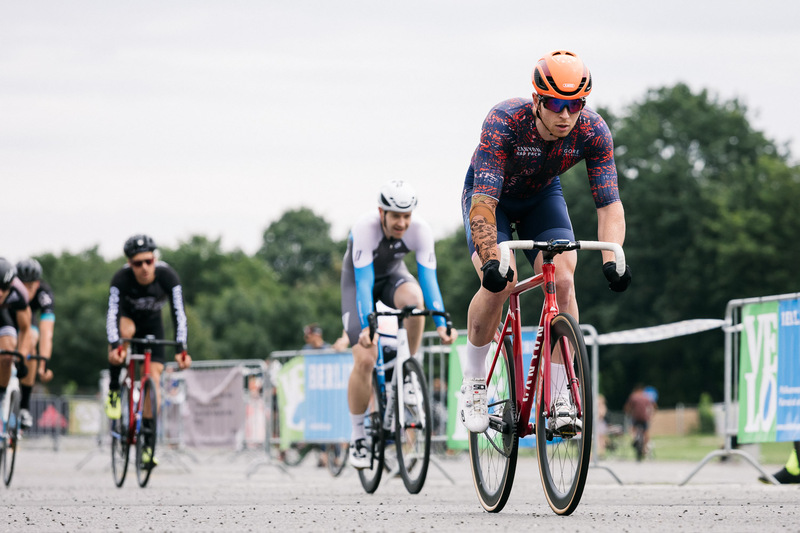 There have been three qualifying races in the fixed gear category of the men. 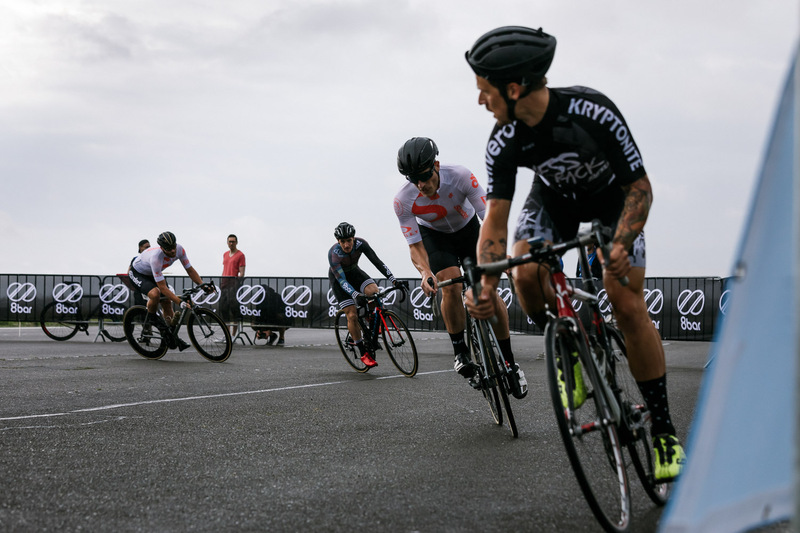 The fastest 25 riders were directly qualified for the final. 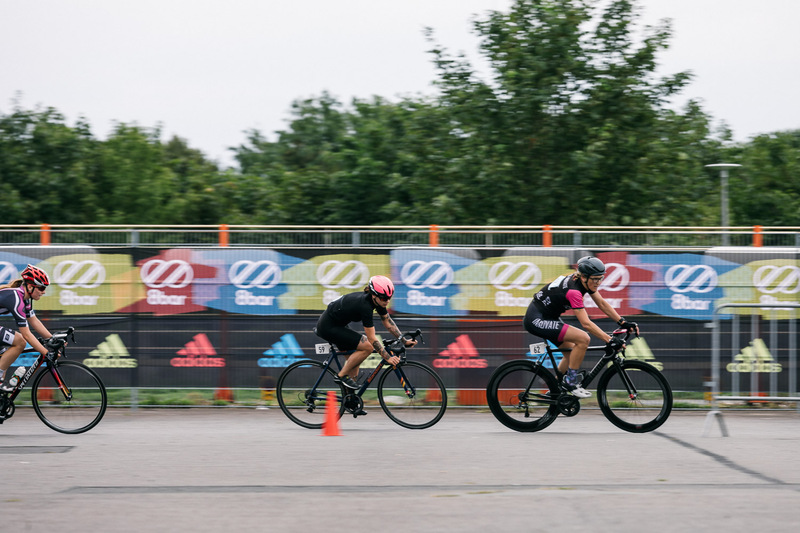 All of the others took their chance in the Last Chance Race for another 10 tickets for the final. 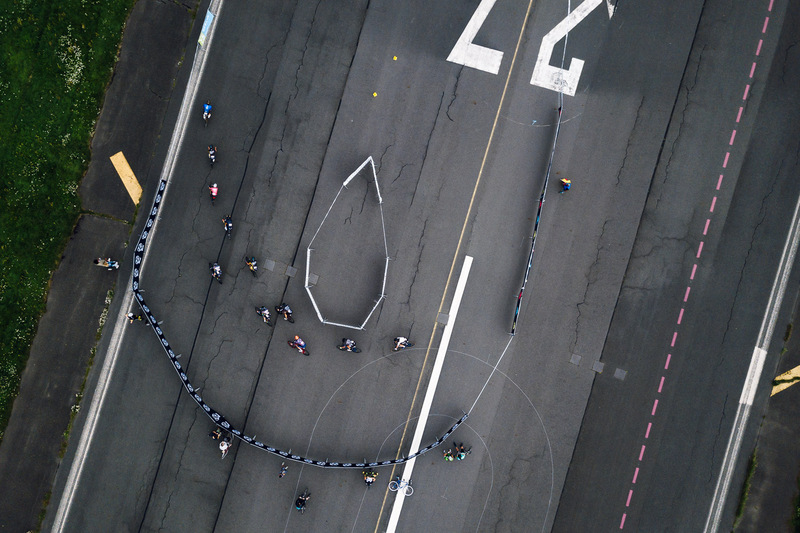 Once again, the qualifying time was important for the starting position in the final race. 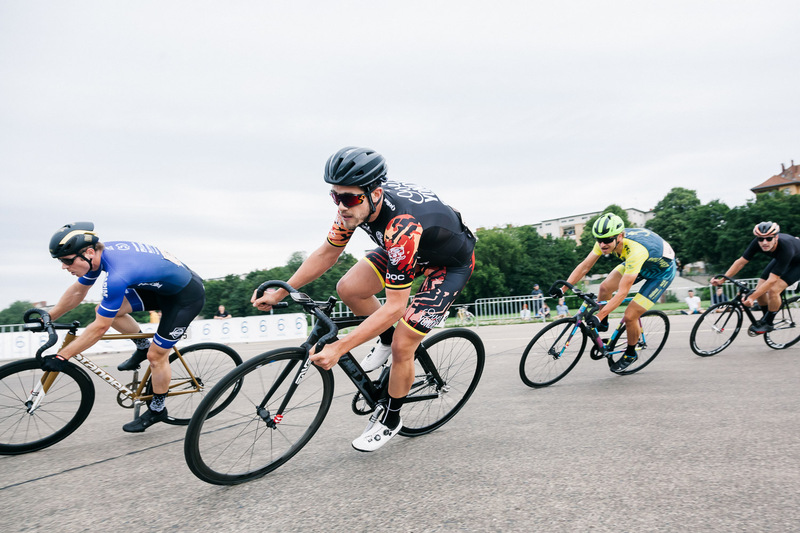 That is why the riders showed a great performance in that early stage of the whole crit. 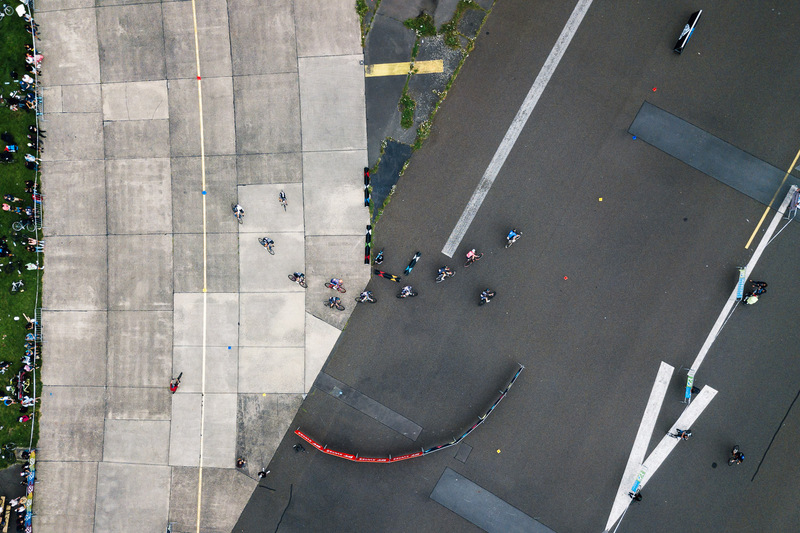 The result: fast lap times and exciting race situations. 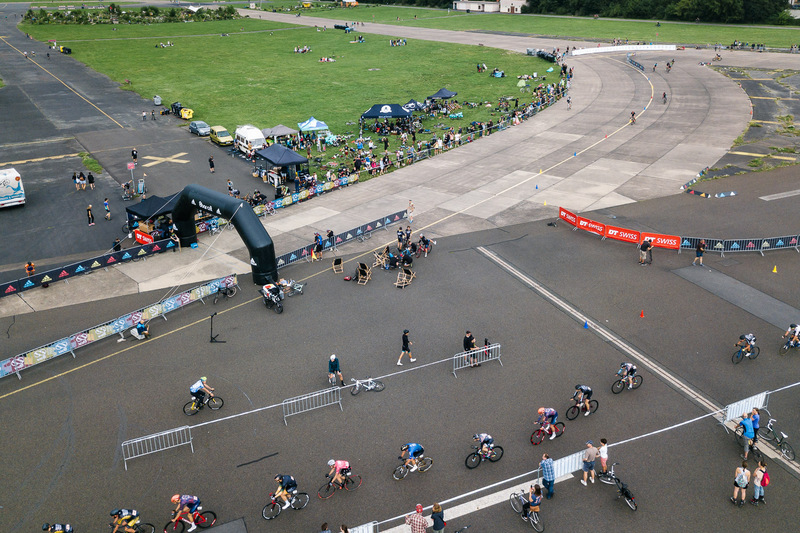 That was indeed fascinating to watch by all the visitors and spectators. 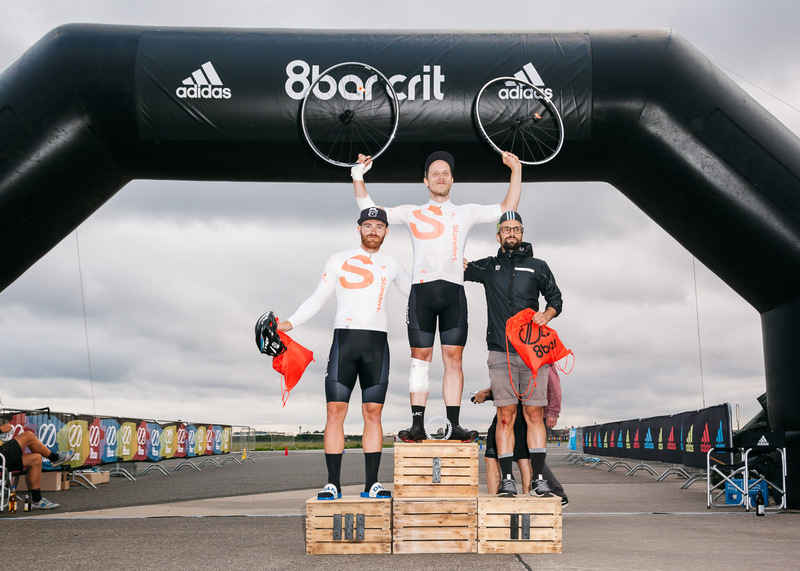 Before the finals of the fixed gear category started there was the race of the road bike cyclists which is the new category of the 8bar crit. 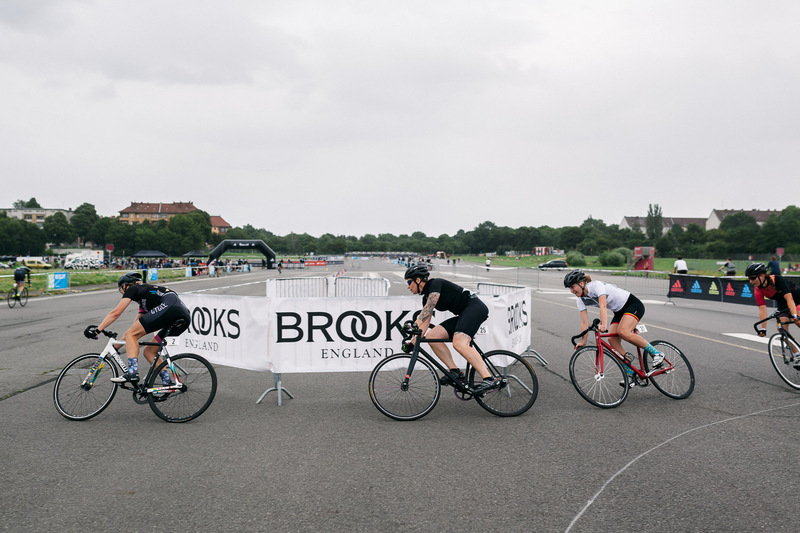 Whoever might have thought that this means a break for the fixie riders until the finals were wrong because some of them started in both categories – road and fixed. 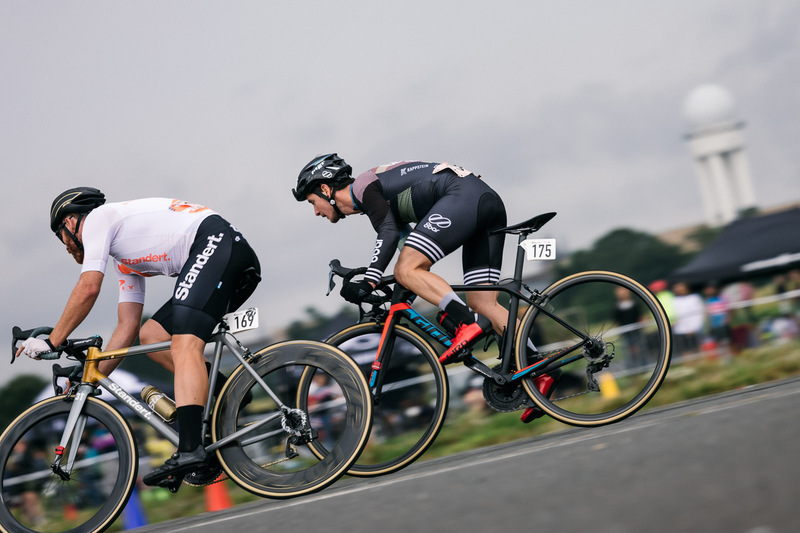 We salute the performance of these double starters, which took place under adverse conditions. 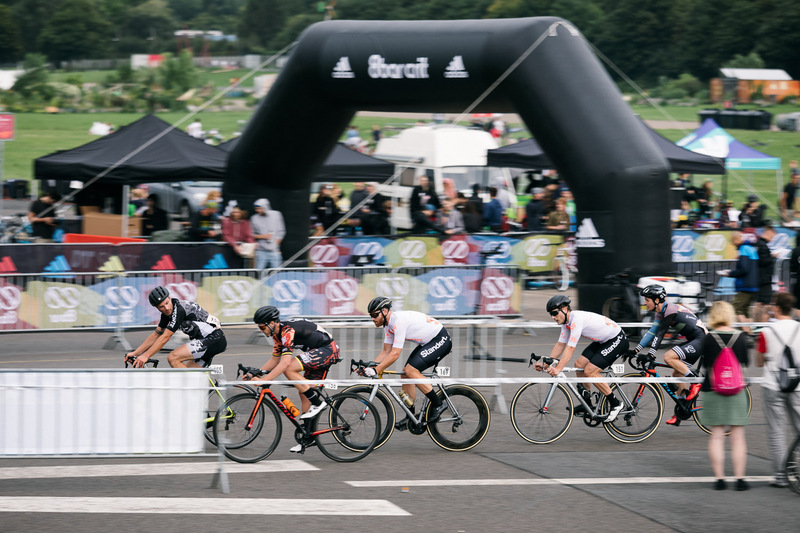 In the men’s race, the sun, wind and rain alternated at cool temperatures in minute intervals. 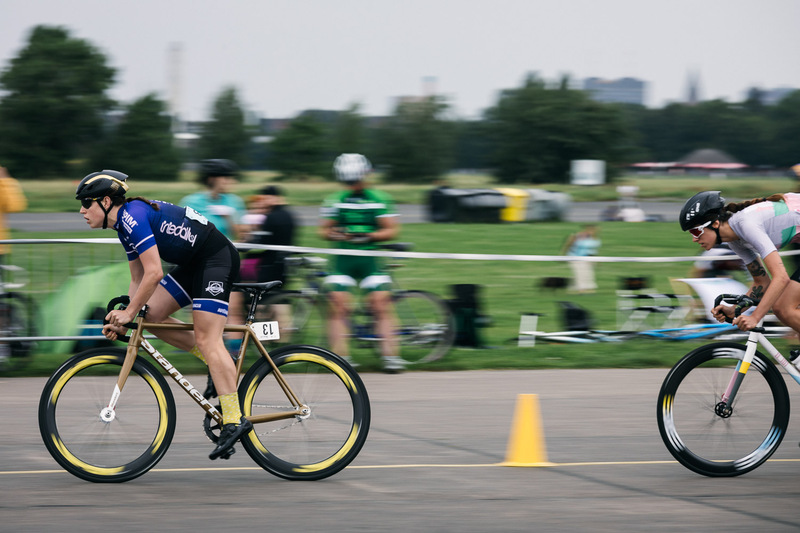 The track therefore changed steadily. 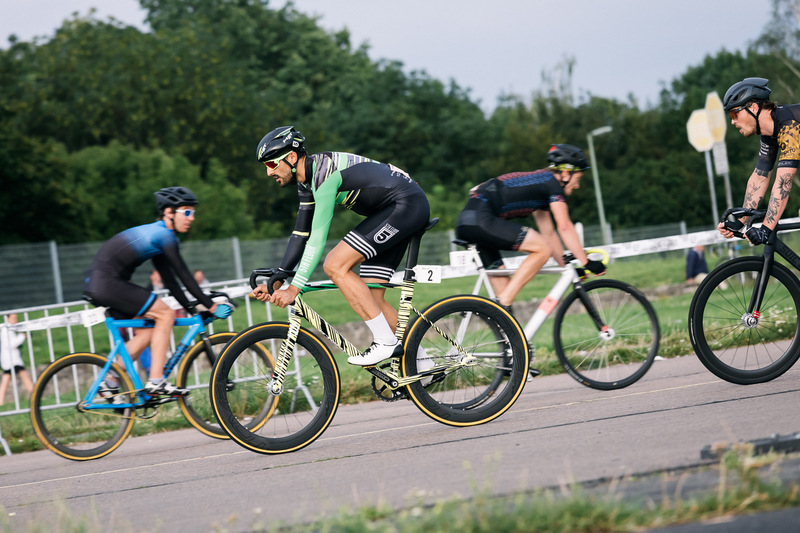 No easy thing for the riders. 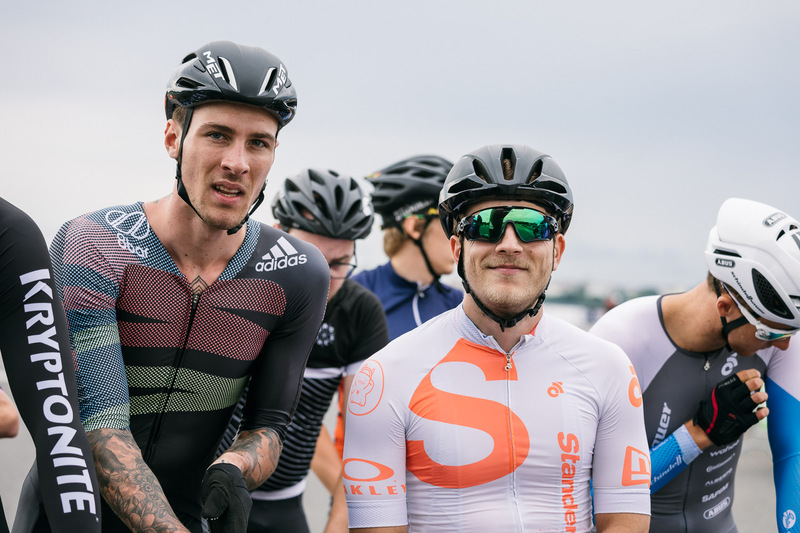 Nevertheless there have been fast lap times. 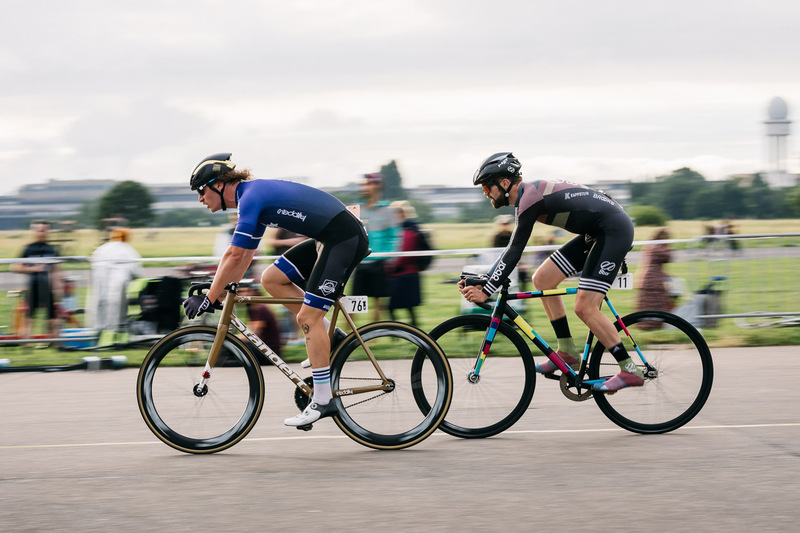 Both in the men’s and women’s field, the leading riders in the race took a considerable lead, which brought them the safe first place on the podium. 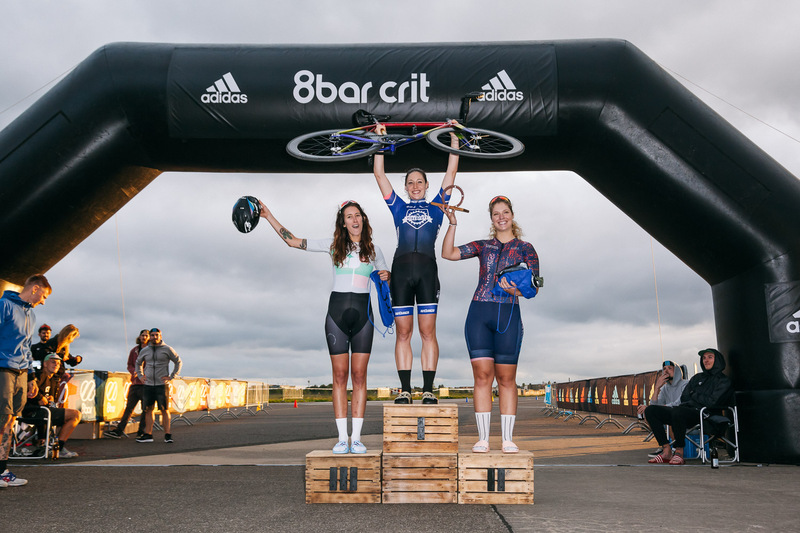 The women had luck with the weather in the fixed gear final. 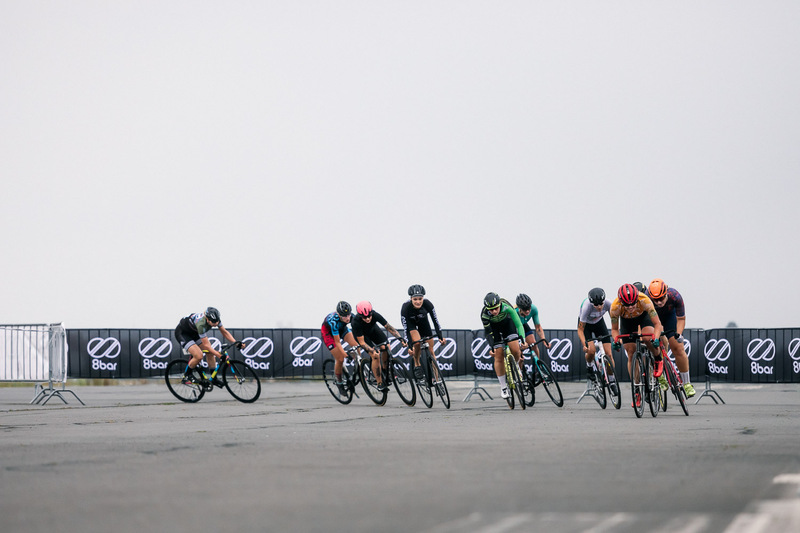 On the dry track, however, the leading group needed to keep a clear head on the 20 rounds. 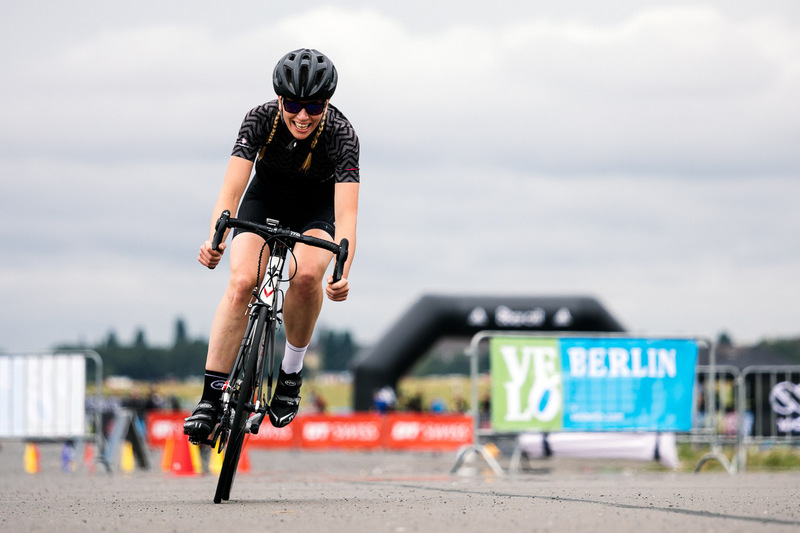 The strongest riders in the field quickly set off and gave the spectators along the track an exciting cat-and-mouse game with tactical position changes and explosive attacks that ultimately culminated in a final sprint which Tanja Erath of the team Fixedpott won. 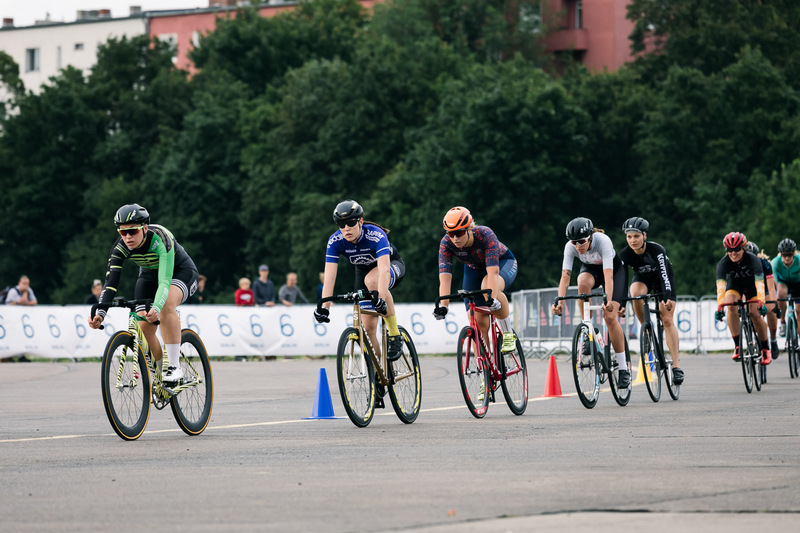 The final of the men in the fixed gear competition started with an impressive picture. 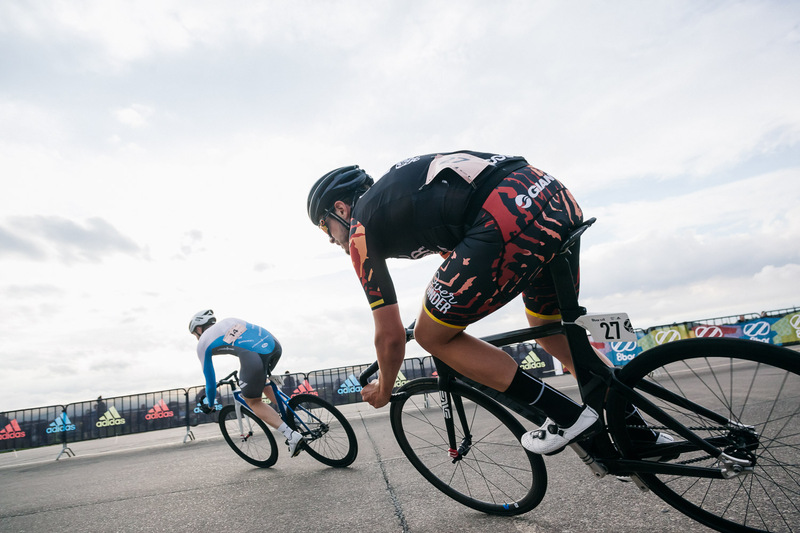 At the same time 85 riders entered the race and fought for the best position in the field right after the start. 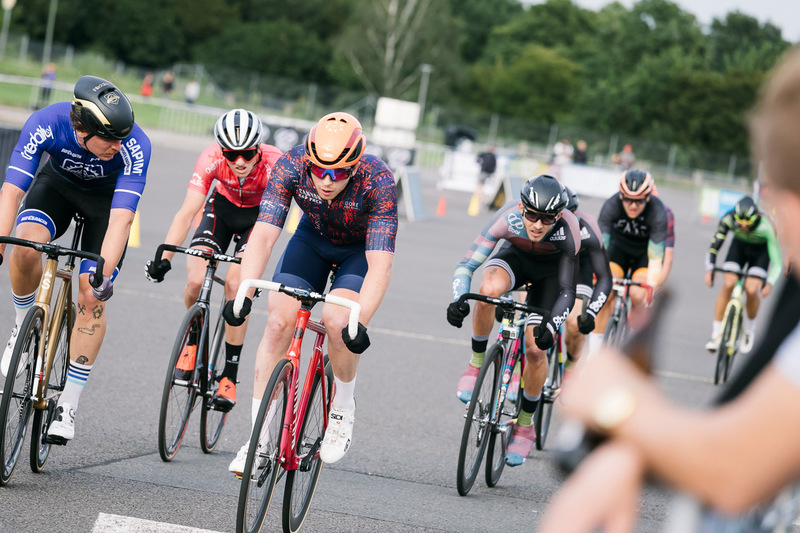 Again, a leading group quickly set off and fought hard the whole final race over the course of remarkable 30 laps with all together a distance of 30 kilometers. 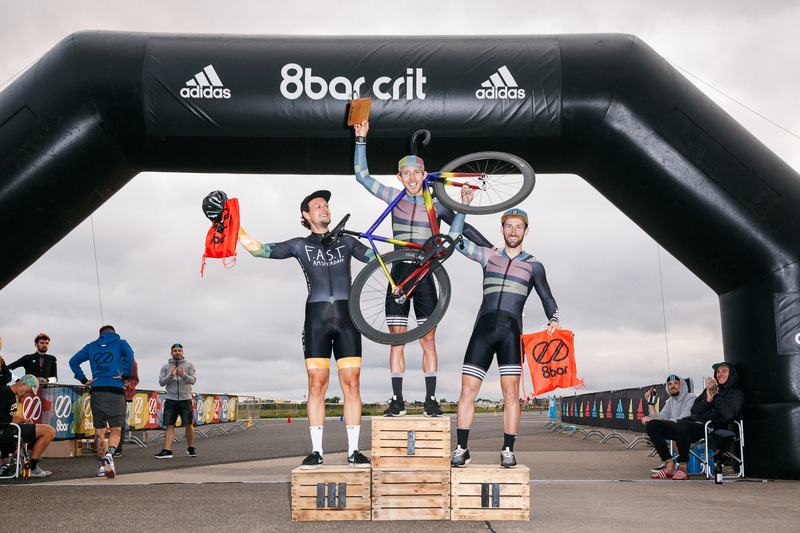 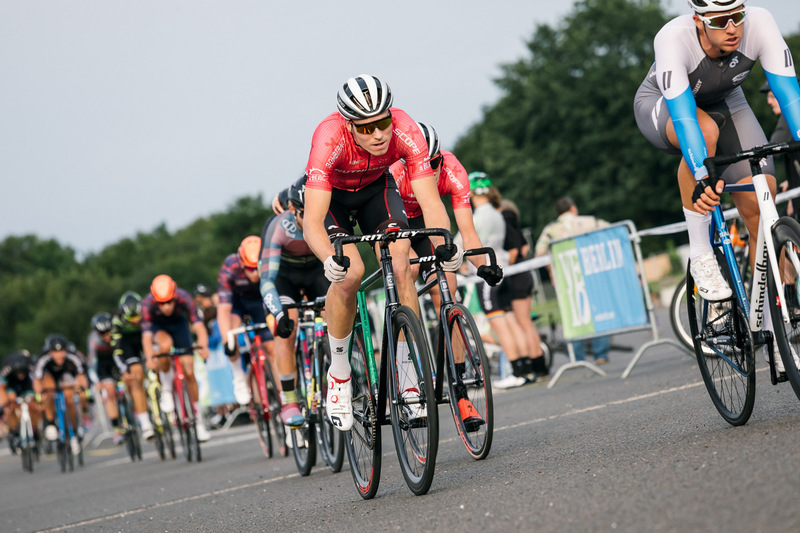 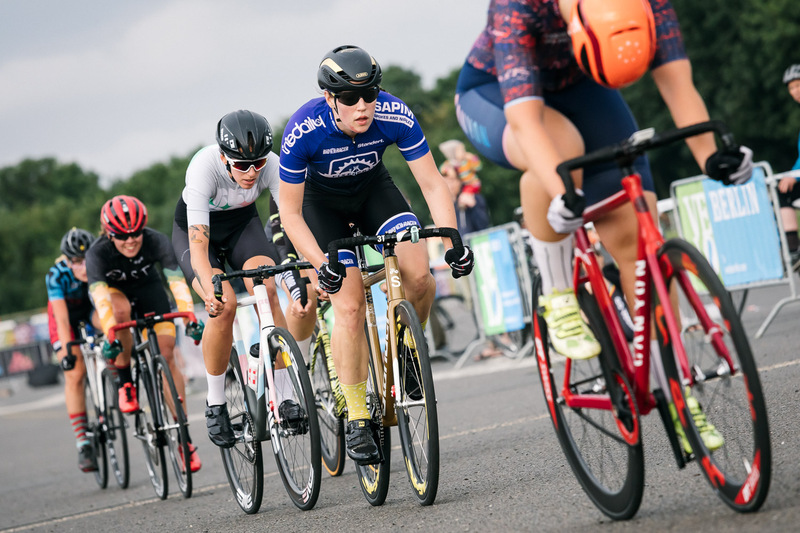 Aggressive attacks, fast speed, tactical maneuvers and smart teamwork – it was once again shown that the fixed gear sport is becoming more and more professional and that the 8bar crit can compete with the big well-known fixed gear crits. 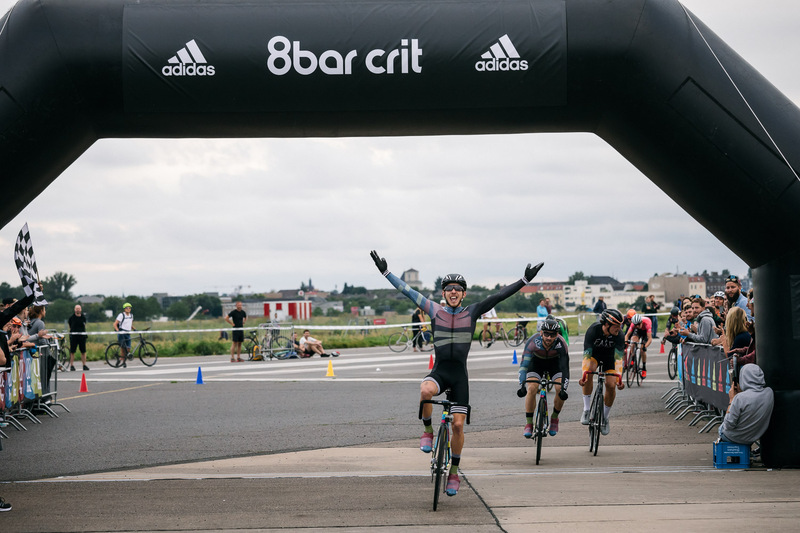 With an explosive sprint David Van Eerd from the 8bar team got the win. 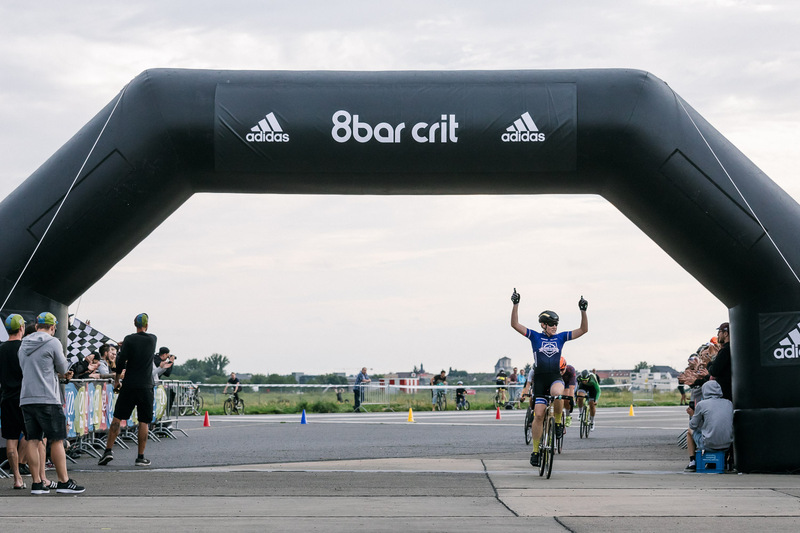 A team evaluation completed the 8bar crit. 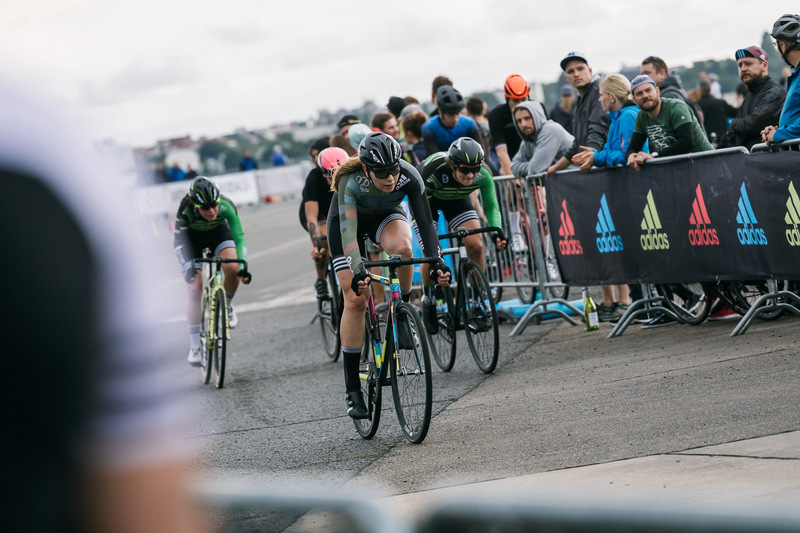 The fixed gear results (women and men) of the teams were summarized here. 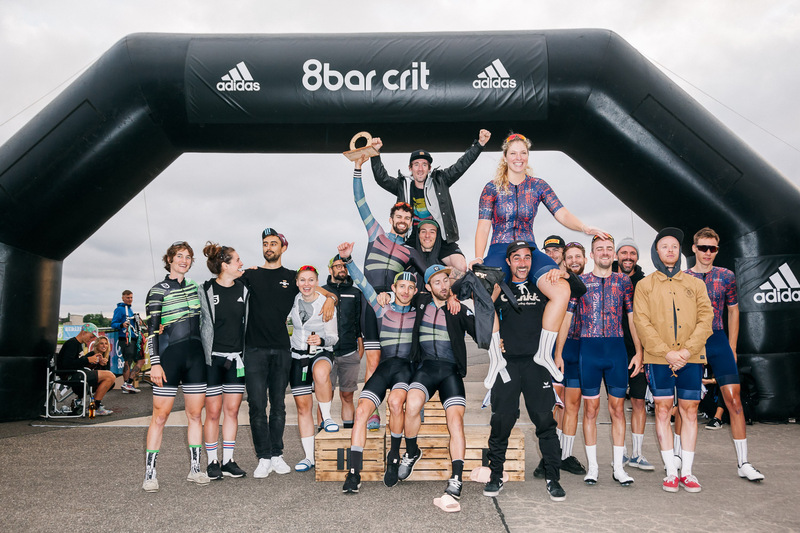 Thanks to the very good performances and placements of the 8bar team, they have managed to win the award for the best team. 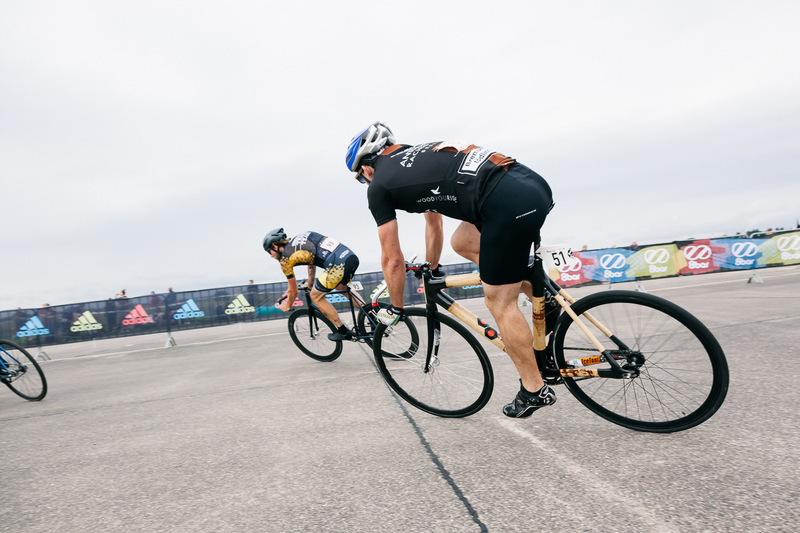 The very strong team from Canyon Rad Pack took the second place. 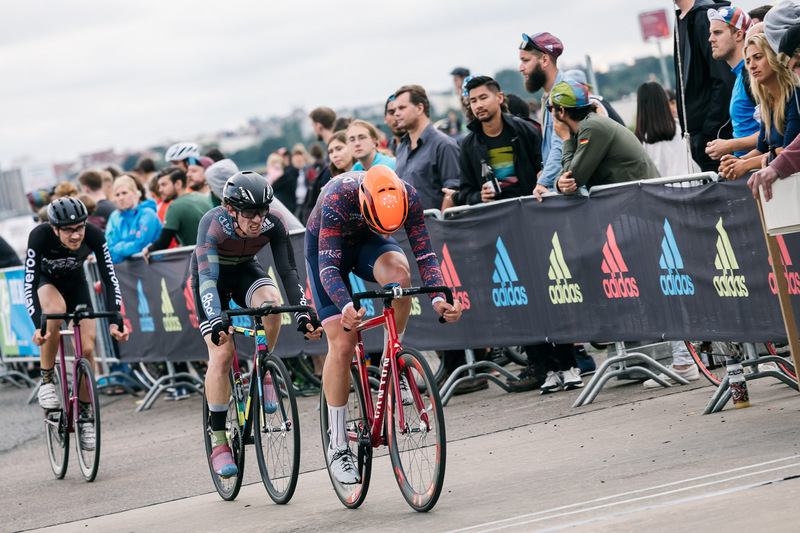 The 5th Floor from London celebrated the third place. 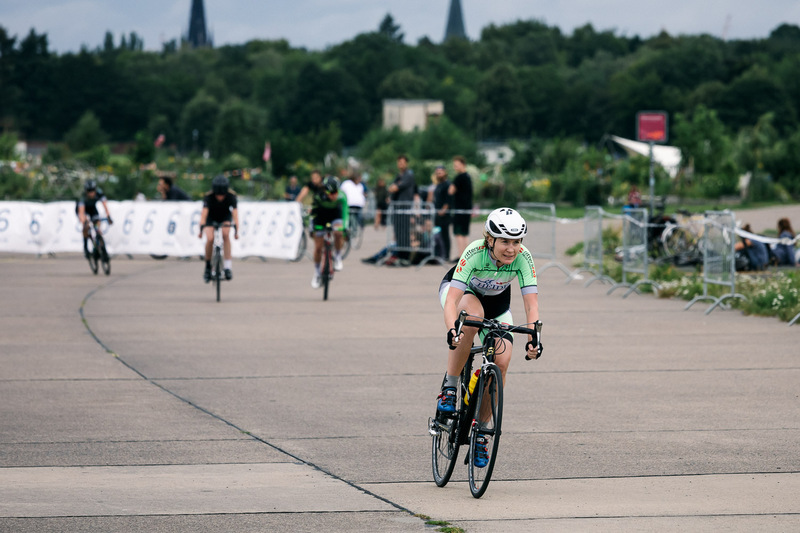 It is great to see that more and more national and international riders and teams come to Berlin every year to participate in our race. 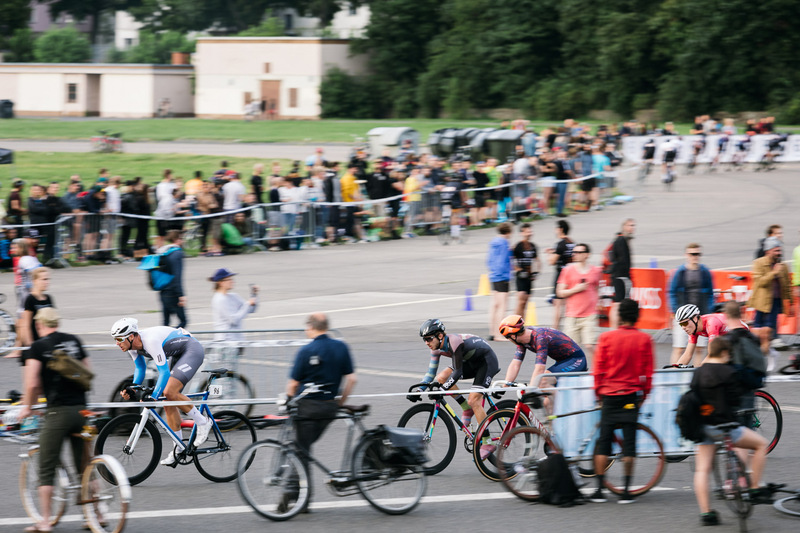 Thanks for the support of the many volunteers, the sponsors and the operators of Tempelhofer Feld, which allow us to make the 8bar crit possible. 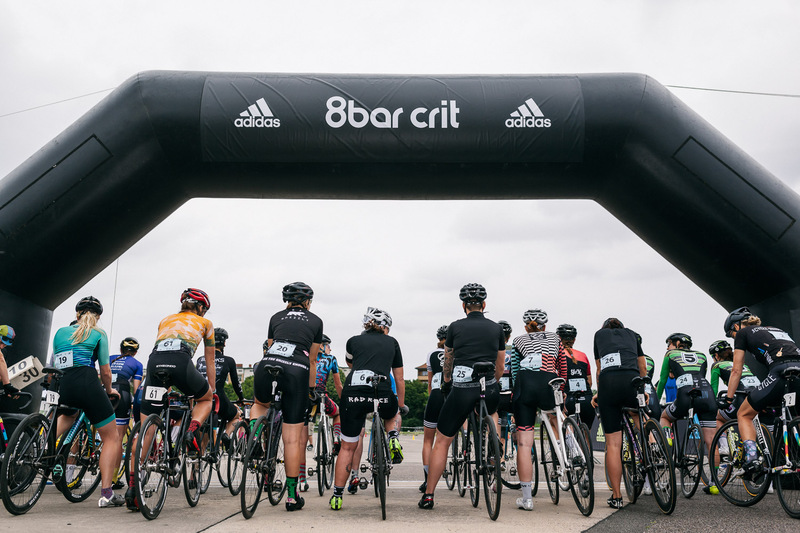 We are already in the planning for the 8bar crit 2018 and are looking forward to seeing you again next year. 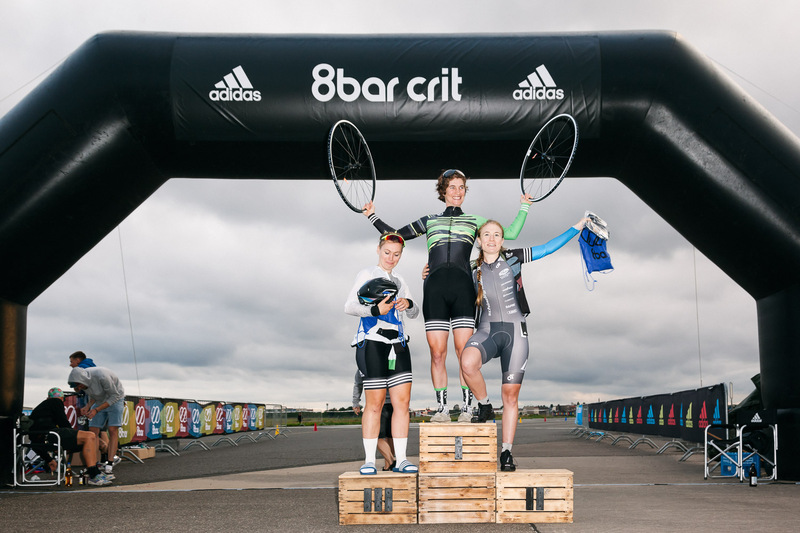 Find all results on the 8bar crit Facebook page. 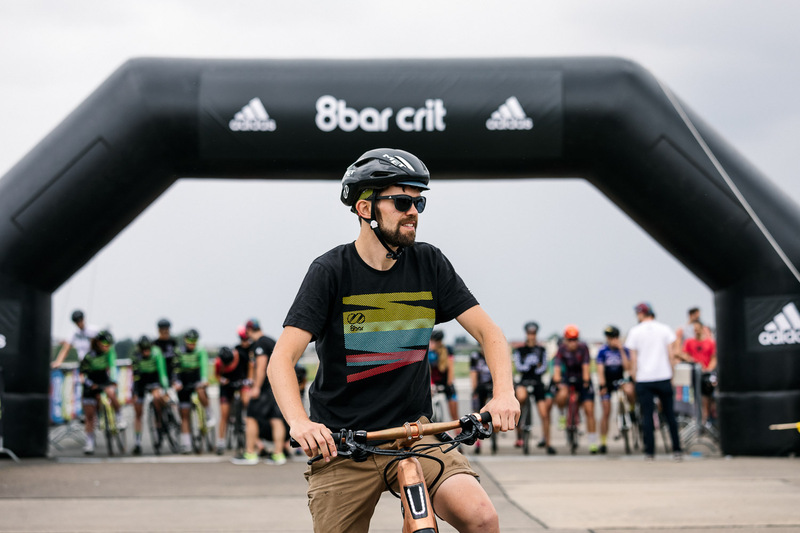 8bar team apparel – available now!